As of Friday, January 18, 2019, the sentencing is over for Donny J. Blakely, Jr. of Gladstone, and he has been transported off to prison to serve 100% of his 32 year stretch for taking the life of the beloved community member and Korean war veteran, father and grandfather Rex Mynatt, Sr., of rural Carman. Mynatt was needlessly murdered on the evening of Thursday, October 5, 2017 as Blakely, Jr. accompanied by Angel Logsdon, 40, of Gladstone, waited in the dark near the property of Mynatt's trailer home for the unarmed, 87-year-old man, to return to his home. Blakely murdered Mynatt, and to conceal the death, he and Angel Logsdon put the murder weapon, shoes, and clothing in a bag and into the Mississippi River near Putney's Landing. It was later recovered by police officers. In court, Blakely, in an negotiated plea, pled guilty to an amended "Count I: First Degree Murder (Class M)" charge, in violation of 720 ILCS, 5/9-1(a)(1). ":in that said defendant, without lawful justification and with the intent to kill, or do great bodily harm to Rex A. Mynatt, Sr., caused severe injuries to him by personally and forcibly inflicting blunt trauma to the torso and head of Rex A. Mynatt, Sr., thereby causing the death of Rex A. Mynatt, Sr.."
The courtroom was filled with family and friends of the victim, along with 5 plain clothed state investigators, and 7 or 8 state and local police officers who stood around the courtroom. As Blakely's charges were read by States Attorney Colby Hathaway of the trauma he caused to Mynatt, the tears begin to uncontrollably flow from family members. The family was just called in on Monday of that week to learn of the negotiated plea. During the short proceedings, the honorable Judge Raymond A. Cavanaugh, as required by law, made sure that Blakely knew of his rights that he was giving up, such as a bench or jury trial, and made sure he was taking any medication as prescribed and that he was of clear mind and still wanted to plea guilty which means he did the offense as charged and was indeed guilty. Before sentencing, a list of previous offenses by Blakely were read by States Attorney Hathaway which included several convictions and time served in jail: felony offenses, disorderly conduct, disorderly conduct and trespassing, domestic battery, aggravated assault, criminal damage to property, battery and 2 years in prison for criminal damage to property. In a tearful impact statement by Rex's daughter Linda Markey, who found her father that horrific Sunday in October 2017, said, "Facing you today is the hardest day of my life!" She reminded Blakely what he had taken from her and their family and contrasted the life her father had lived compared to the life he had lived and was going to live. She mentioned Blakely's drugs and alcohol, then her father's working to support his family, his service in the Korean War, his dedicated life in helping friends and family, after losing his humble home to fire, working two jobs. "He lived, even though he lost the love of his life. He lived and loved to go to church every Sunday." And in her tears, "he died, a senseless death, due to your drugs and drunken life." "I can not forgive you for what you've done, but I hope I forget you," she said. Linda went on to thank States Attorney Hathaway and Judge Cavanaugh for helping to seek justice for her dad. A granddaughter, Jessie Mynatt, also gave a statement of the impact it has had on her, mentioning all he meant to the family and so many others. "Grandpa wasn't afraid to fight!" mentioning his service in Korea and his service in the Legion Auxiliary honor guard giving the 21-gun salute to many deceased veterans. "That same group stood sadly and lay him to rest," she said. Blakely stood and said, he felt "remorse" for what he had done and he was sorry for what he had taken from them. Judge Cavanaugh said to the defendant, "You've been given many opportunities, but for some reason you've taken this path, commenting this cowardly act-you came upon Mr. Mynatt when he could not defend himself. I'm glad you gave some remorse to the family." The judge accepted Blakely's guilty plea and signed waiver giving up all rights to any aspect of his conviction and sentence through withdrawal of his guilty plea, appeal, or other past conviction proceedings. He sentenced Donny J. Blakely, Jr. to serve 100% of the 32 years in prison, saying, "I hope you use the time to think of the destruction you've caused." He said it will cost the state around $30,000 a year to house Blakely. Blakely was ordered to serve 3 years of probation upon release in 32 years and all remaining financial obligations shall be paid within 6 months of his release from custody. He is entitled to receive credit for time he actually served in custody for 466 days as of the January 18, 2019 and was ordered to pay criminal charges in the amount of $2,330 and court costs of $446, required within 6 months of his release from custody. The defendant shall receive pre-sentence credit in the amount of $2,330.00, according to the sentence. Counts II thru V Murder charges were dismissed along with four felony cases that were filed in connection to the case. The Sheriff's department received Blakely into custody to deliver him to the Dept. of Corrections which shall confine him until expiration of this sentence. At IDOC in Joliet, his state prison will be selected and he will be transferred for his 32 year-stay. 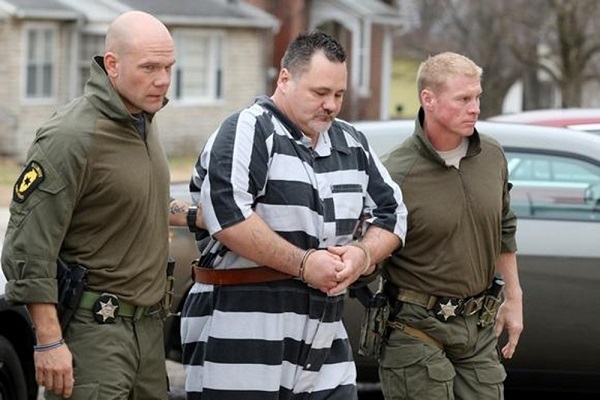 Donny J. Blakely Jr., 42, Gladstone, appeared in Henderson County court in Oquawka on Friday and was sentenced for First Degree Murder. Before Judge Raymond Cavanaugh, Blakely pled guilty to murdering Rex Mynatt, Sr., of Carman in 2017 and waived all of his rights for a trial. He was sentenced to 32 years in prison. The state prison he will be serving the 32 years in, is to be determined by IDOC at Joliet Correctional Center where he has been taken.